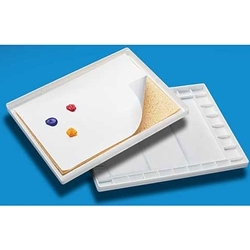 A convenient double-sided palette, designed with one side for oil and acrylic paints and the other for watercolors. This 10" x 14" palette fits easily into the air-tight Artist Palette Seal (MEPS) storage box for storage life up to several weeks. It comes with disposable palette sheets made of acrylic and oil film. Packs of forty refill sheets also available.